First, this chapter presents the differences between soft and hard perspectives in operational research (OR). 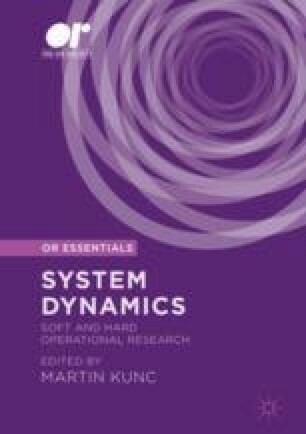 Then it describes the positions in the system dynamics (SD) field related to the soft and hard perspectives on the use of SD. The conclusion of the evaluation is that there are important tools and methods in SD that can easily be accommodated in the soft OR paradigm as a problem structuring method. Simultaneously, SD quantitative modelling shares many commonalities—such as data-driven testing, extensive numerical analysis and focus on outputs—with hard OR tools that can easily be adopted as a critical component on any hard OR course. To evaluate the positioning of SD researchers in the field, I analysed the papers published in Journal of the Operational Research Society from 1978 to 2016 and selected some to be part of this edited volume. Therefore the onus of the positioning resides in the SD user, but there are two important suggestions. First, the SD user needs to be grounded in relevant literature from the perspective employed, such as group model building literature if qualitative SD is employed. Second, there has to be a critical reflection on how the same problem can be addressed using the other perspective, such as a quantitative model offering policy advice based on numeric results needs to explain the impact of the policy using qualitative SD (causal loop diagram).